A short drive South from Calais brings you to the charming coastal town of Hardelot, home to one of France's most prestigious golf clubs. 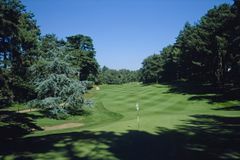 Hardelot's Les Pins is a past French Open host while this year's overhaul of Les Dunes has established it as one of the region's ‘must play' courses. Excellent local hotels complement the outstanding championship golf, while the golf courses of Le Touquet, Wimereux, Belle Dune and Dunkerque are also available. To plan your perfect tour speak to our dedicated Hardelot specialists.